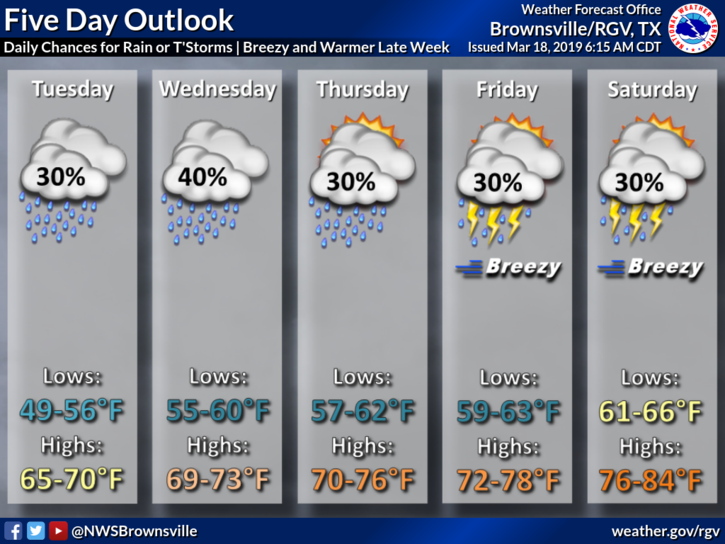 Monday in the Rio Grande Valley will trend wet, especially in the morning, with cloudy skies and temperatures in the mid 60s, according to the National Weather Service in Brownsville. Brownsville and McAllen are expected to reach highs of 65 and 66 degrees, respectively. South Padre Island will be 64. Looking ahead, cloudy to mostly cloudy skies and daily chances for rain or thunderstorms are expected throughout the week. Temperatures will slowly rise through the week with highs reaching the 80s for a some areas by Saturday. Wind speeds pick up Friday and Saturday from out of the southeast.